War isn't just tough on soldiers. Army wives whose husbands were deployed have higher rates of depression, anxiety, sleep disorders and other mental health issues than the wives of soldiers who stayed home, a new study shows. Researchers looked at the medical records of more than 250,000 wives, accounting for most women married to active-duty U.S. Army personnel. Between 2003 and 2006, about 34 percent of the women's husbands deployed for one to 11 months, 35 percent deployed for longer than 11 months, while 31 percent of soldiers were not sent overseas. Among wives of soldiers deployed for up to 11 months, researchers found almost 3,500 more diagnoses of depression, anxiety, sleep disorders and other mental health issues than among wives who[se] husbands stayed home. Click on image above to see Mansfield discuss study. Time for a little breather? After clicking off on the ad as the clip begins, this YouTube video turns into a relaxing and fun break (esp. for those of us in the north with snow on the ground). I always get a hankering to get away somewhere warm right about now. Virtually drifting off to Florida to listen to the ocean waves and watch the birds play on the beach is...ahhhhh! President Obama and our military have begun humanitarian ops in Haiti, and roughly 10,000 troops will be stationed in the area by Monday. While the strain on forces and milfamilies needs to be relieved (and this isn't going to help), we must respond. In extended, preserving a few press reports related to the military's humanitarian work in Haiti right now. The first entry is especially stat and data rich. Sometimes we inflict it. Sometimes it happens to us. Sometimes it's both, as it is with combat veterans. While this blog focuses on military experience-derived injuries and stresses such as TBI and PTSD (clinical and encyclopedia definitions), traumas of all sort and stripe share one thing: surviving something life-threatening or outside everyday occurrence. Being raped; a victim of an explosive hostage situation or other terrorist activity; in a severe auto, airplane or other vehicular accident; on the receiving end of domestic violence and/or abuse; serving in combat; or involved in a natural disaster like Haiti, for some may spark future PTSD symptoms. Victoria Fine at HuffPost lists disaster relief organizations, helpful for those looking to donate. David Baldwin's Trauma Information Pages will hone your natural disaster response abilities (lots of info here). In the wake of Katrina, blogger AlphaGeek wrote a series of uber thorough posts on personal disaster preparedness. In extended, Red Cross tips for helping disaster victims and a piece on how many in the U.S. are affected by the tragedy. Survive in time of sorrow. PBS' This Emotional Life, a three-day program running from Jan. 4-6, begins tomorrow. Its six hours explore topics such as grief and loss, addiction, anger, stress and anxiety, creativity and flow, humor, resilience, happiness and more. While each evening looks to be well worth a viewing, for those coping with or caring for someone with post-traumatic stress, be sure to tune in on Tuesday and Wednesday nights when the topic will be presented via the experience of an Iraq veteran and his family. See the video clip -- along with a few other topic preview clips from the show and a full description of each night's episode -- in extended. You might also check out PBS' information and resource-intensive website. 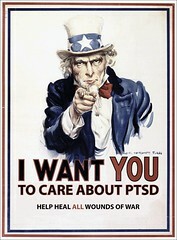 Happy New Year, readers of PTSD Combat. I do hope that all of you, old friends and new, have had a great Christmastime, and that your holiday season has been filled with some light and wonder and many moments free from worry and stress. For those of you who have followed my work since '05, or for new friends to be made in this new decade, I send you a generous New Years Day dose of gratitude. Thank you for your interest in my work. While the need to continue spotlighting issues near and dear to the American military family and their supporters is motivation enough to keep going...your positive support fuels me onward, too.